I still remember my first eBay sale. The year was 1999. While visiting my parents, I searched through my childhood closet and emerged with a few random items: a pair of ice skates complete with requisite orange pom-poms, a set of hair rollers last used at a sleepover in middle school, and a packet of handwritten notes I prepared while studying for the New York State bar exam. Those notes sold for a whopping $100. Keep these items in a designated area so you can quickly access them on the day of your sale. I cannot stress how much easier my eBay life has become post-Poly Bag. More on these Poly Bags later . 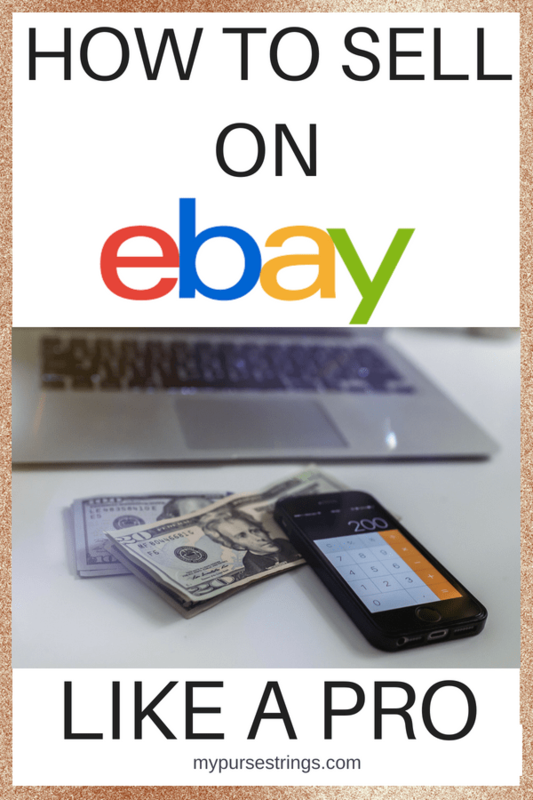 . .
Of course, before you go any further, sign-up for eBay of course and download the app. Every so often, take stock of your belongings. Inspect your kids’ playroom. Even better if you can do all this when they are not home. Organize everything into the following piles: keep, trash, donate or sell. During my last sweep, I found my husband’s never used [easyazon_link identifier=”B0095PZHPE” locale=”US” tag=”mypurstr-20″ cart=”n” popups=”n”]FitBit[/easyazon_link] and sold it for $45. Baby and children’s items are big sellers. I sold one stroller with local pickup. The buyer saw me, majorly pregnant, and asked when I was due. I told him I was just waiting for the sale to be over as I was already in labor. True story. When I sold my second stroller, a huge [easyazon_link identifier=”B01F7DWY9O” locale=”US” tag=”mypurstr-20″ cart=”n” popups=”n”]Baby Jogger City Select[/easyazon_link], I tossed the entire thing into a box and dropped it off at a shipping facility. Don’t disregard anything. You’d be surprised at some of the things people will buy on eBay. Oh, and that broken electronic device. Did you know you can sell it for parts or list it as not working? Although I don’t sell on eBay often, according to my Seller Dashboard, I have sold 153 items and made over $2,600. Not too shabby. Although this research takes only a couple of minutes, it will help you make the decision whether to sell or not. The item I will list today is the [easyazon_link identifier=”B003KN27FA” locale=”US” tag=”mypurstr-20″ cart=”n”]JJ Cole Original Bundleme for Toddlers[/easyazon_link]. First, check Amazon for prices to see how much the product sells for new. On both JJ Cole’s website and Amazon, a similar [easyazon_link identifier=”B003KN27C8″ locale=”US” tag=”mypurstr-20″ cart=”n” popups=”n”]BundleMe[/easyazon_link] lists for approximately $50. Secondly, search eBay for current listings of the same item. At what price point, are most sellers listing the item? You want to focus on the latter as “completed items” also includes those that were listed but never sold whereas “sold items” assists you in determining the actual worth of your item, i.e., what people were willing to pay. You can also “watch” similar items that others are selling to gauge interest and determine a fair price. I see that someone recently sold the exact same BundleMe for $19.99 plus an additional $10 for shipping. *Note, if you want to sell a grouping of something such as ten pairs of jeans, use the word “lot” in your search to pull up similar listings. After finding the item closest to mine, under that listing, I click on “sell one like this.” All relevant categories are pre-filled, minus the photos, details, price, and choice of payment. I snap a couple of photos while still within the app, fill out my description, adding details and making sure to disclose any defects. eBay guides you in the pricing. In my case, eBay tells me that similar items have sold between $4.99 and $8.99. I decide to start the bidding at $6.99 plus shipping (following others’ leads on similar items, I decide not to offer free shipping) and a “buy it now price” of $15. I leave shipping set to its default of USPS Priority Mail. If you click on the shipping tab, you will see at the bottom a section entitled “Ship Internationally” using the “Global Shipping Program.” I have successfully used this feature, which basically means that upon making a sale, you send the item to eBay and they take care of shipping it overseas. I only accept PayPal as payment and I do not accept returns. Right before you list it, you are given the option to “auto relist” for two times if the item does not sell. By default, the listing runs for 7 days but you can change it anywhere from one to ten days. Once you receive notification of a sale and payment (always wait for payment before shipping), it’s time to pack the item for shipment. I wrap the item in either bubble wrap if delicate or [easyazon_link identifier=”B009BYH37E” locale=”US” tag=”mypurstr-20″ cart=”n” popups=”n”]packing paper[/easyazon_link]. I close it up with a piece of tape and attach a personalized thank you note to the buyer. My biggest tip of all . . . Always try to make your item fit in a [easyazon_link identifier=”B000HG9I5A” locale=”US” tag=”mypurstr-20″ cart=”n” popups=”n”]Poly Bag[/easyazon_link]. Here’s why: if your item weighs 13 ounces or less, you may ship it by First Class Mail. What does this mean? You don’t have to go into the post office. You don’t have to wait in line! You can drop your package into a mailbox. And, this is why I use the Poly Bag. It’s that light. The bag self-seals, although often, I fold it over itself to make a secure fit and add some extra tape. No more looking to see if you have the right sized boxes. Hey, I’ve even taped two Poly Bags together. The BundleMe easily fits into the larger of the two bags. In the past, I’ve managed to ship a baby mobile, a crib bumper, and a maternity coat, each within a large Poly Bag. Now, get your [easyazon_link identifier=”B00SMHWZ42″ locale=”US” tag=”mypurstr-20″ cart=”n” popups=”n”]postal scale[/easyazon_link] out and weigh your packed item. Once you know the weight, eBay does most of the work figuring out shipping. Print your mailing label directly through eBay. You even get a discount on shipping. I have a great mailman. He takes my larger packages as well, although he routinely reminds me that protocol requires me to schedule a pickup through the USPS website. I’ll tip him extra this holiday season. In the eBay world, your reputation is paramount. Give feedback after the transaction ends and remind buyers to do the same. In fact, that’s pretty much what I say in my personalized note to the buyer after I thank them. You will have situations where the buyer is unhappy. Remember that mammoth stroller I sent out? Apparently, I included the wrong adapter for a car seat and the buyer complained to me. Rather than risk my reputation on eBay or “open a case,” I offered a partial refund which she gladly accepted. Another time, a buyer accused me of not sending something, although it turned out that her sister had taken the package for which she apologized. I once sent out a toy missing a piece. When I contacted the buyer, I told her I would send it off separately. She never received it (I didn’t pack it very well). She respected my honesty and left me good feedback anyway. Communicate often. Be honest, respectful, helpful and reasonable. Just to put this in perspective. Listing the item takes approximately 5 to 10 minutes, including taking photos. Shipping takes another 5 or so. This blog post took you longer to read. *Update: The BundleMe sold for $23.25 (plus shipping paid by the buyer), more than $16.00 over my starting bid price. I received 8 bids. If you want to know other ways to sell your items, check out my post about Poshmark.